No one really knows if the Gypsy Queen is real or not. Click here to play! Tales have been told of her traveling caravan for hundreds of years. Obviously no person could have lived that long, let alone have maintained the beauty she is said to possess. Every year people insist that the Gypsy Queen is an old legend that has gotten out of hand. But every year, someone comes forward with a story of her caravan and each one has seemingly had the good fortune she is said to grant her visitors. You have decided to go in search of the Gypsy Queen and her caravan. It is said that if you wait at a crossroads until midnight on this night, a slot machine will appear before you. If you play it and hit the jackpot, then the Gypsy Queen's caravan will roll in as if it has always been just a little off in the distance. In the caravan are palm reading tables, crystal balls, fiddlers, candles, black cats, and the Gypsy Queen herself. You don't know if the legends are true, but you're the best slots player in town, and you'll have the best chance of proving whether the stories are true. If you'd prefer the comfort of your own home to a damp crossroads at midnight, then go to an online casino and play for the Gypsy Queen jackpot there. Who knows what your fortune holds this night? Crystal Balls are scatter symbols that pay out on the total bet when enough are scattered left to right on the reels, starting from reel 1. 2 symbols payout twice the total bet, 3 payout 5 times the bet, 4 payout 20 times the bet, and 5 symbols payout 100 times the total bet. They also trigger the bonus spins feature or the tarot bonus game. There are two bonuses - the tarot bonus game and the free spins bonus. Both can be triggered by 2 or more scatter symbols on adjacent reels starting from reel 1. 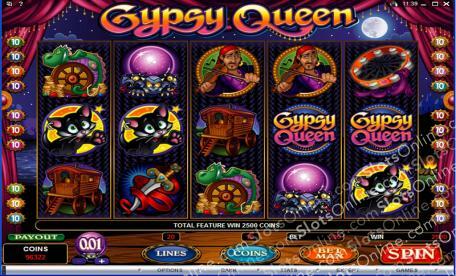 12 to 30 free spins can be won, depending on the number of scatter symbols that trigger the spins. In the bonus game, the player chooses 1 of 6 cards to reveal random bonus amounts. It is possible to win up to 5 additional chances to pick cards, and these additional picks are randomly awarded.